Raymond Weir: The Beautiful Game? On the weekend that a new season kicks off in the Barclays Premier League (a.k.a. ‘the greatest league in the world’), one big question hangs over the world of football. No, it’s not the one about whether Arsenal will ever make a major signing, nor the one about whether David Moyes will be able to fill the shoes of Sir Alex Ferguson. No, this one is even more baffling, namely: Why (oh why, oh why) does the BBC continue to show faith in the punditry skills of Robbie Savage? I have long suspected that Savage must have photos of the Director General of the BBC cavorting naked with a clutch of ladyboys. How else could he have 'earned' his various broadcasting gigs and how on earth does he hold on to them? Most football phone-ins on the radio are bad enough, but Five-Live’s is rendered unlistenable by Savage’s abrasive pub-bore style. Devoid of charm or wit, he’s about as insightful as a pantomime horse and, on a bad day (there are a lot of bad days) he barely achieves coherence. His stock answer to anyone who challenges his view is: have you ever played professional football? It seems to have escaped his notice that a big part of his job is to engage with folk who haven’t played professional football. To dismiss their views because they haven’t makes his show redundant; or at least it should. The fact that he can pick up a wage for sounding like a three-pints-to-the-good taxi-driver talking out of his arse should be enough to force a public inquiry into the validity of the licence fee. To his credit however, Savage has just offered a revealing glimpse into the ‘spoiled millionaire-throwing-toys-out-of-the-pram’ world of top flight professional football. His article on the BBC website about ‘Tricks to engineer a transfer’ is grimly illuminating and a reminder, as if we needed one, that some of our heroes have feet of clay. Among the various ‘tricks’ listed in the article are: sulking, stirring up trouble, fighting with team mates, being a bad influence, undermining the manager and using the media to promote your personal agenda. There have been so many stories of petulant and greedy footballers that, as I read the piece, I found myself putting names against each of these ‘tricks’. 'It can be hard to do, but one sure way of losing the manager's backing is by not giving 100% in a match. I say it's hard to do because you're not just letting yourself down, you are letting your team-mates, fans and family down. I only did it once and I'm not proud of my actions, but it felt like it was the only avenue left open to me. That was the point at which the manager knew he had lost me and there was nothing he could do to keep me'. 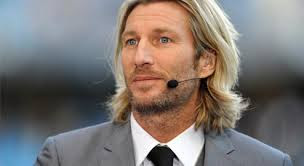 His claim that there was only occasion in his career when he didn’t try has the same kind of hollow ring as someone saying that ‘I only ate one of your chocolates’ or ‘I only visited one pornographic site’ or ‘I only exaggerated one expenses claim.’ And sadly, Robbie Savage is by no means unique. If he is owning up to this stuff, we know for certain that many other footballers will have done the same things, in spades. That’s quite a concept to grasp, that professional players, often on huge salaries, might not be trying when they cross that white line. Anyone who forks out more than they can sensibly afford on top flight football should weigh up the investment made against the enjoyment gained, offset now by the knowledge that not everyone on the field of play will necessarily be playing the game as we, the audience, think it should be played. But when we suspect, or believe, that not all of the competitors are doing their best, a knife is driven into the heart of competitive sport. Savage has done us a favour by shining a torchlight into football’s squalid basement. It’s a dank and dismal place full of horrible creepy crawlies, grubbing around in a frenzy of greed, grievance, megalomania, petulance and a bit more greed. Welcome to the new season. Labels: Barclays Premier League, BBC, cheating in sport, Five Live, football phone-in, Robbie Savage, transfer window.